A grav tank providing armoured support to a Harook infantry patrol as they cross open ground. The grav tank vents steam from its fusion drive as it hovers over the ground. This is where the idea for the flying base came from and this is where the modelling technique came from. Might try out some different painting techniques for the smoke, trying to light from the top with a bit of the purple coming through from inside, any advice on painting smoke is welcome. Harook, as always, from Mad Robot Miniatures (can't reference them enough!). Grav tank courtesy of the overly optimistic sales forecast for Tron diecast toys. The Harook Purple Poop Propulsion system in action! I used "invisible" 10 second Not More Nails, but it didn't go transparent enough. I've got another experiment on the way with a water effects gel thats may replace the PPPS if it works. Would be nice if I could put a little blue LED in there and a little watch battery but that might be a bit excessive. Has no one told the Harook not to flush while in the station? 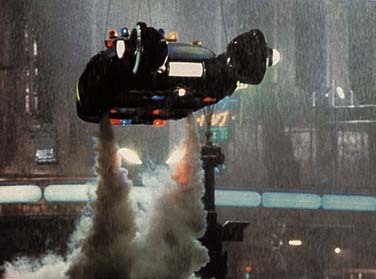 Maybe a double stream of "steam" would reinforce the Bladerunner idea.